Unable to excavate their own cavities, goldeneyes are in constant search for good nesting sites. 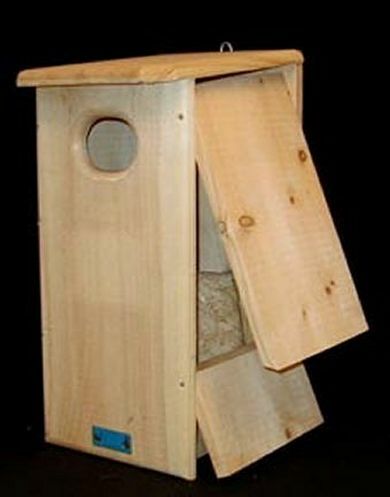 With a larger entrance hole than the Wood Duck House, this box comes with wood chips and a ladder to provide an ideal place for goldeneyes to lay their eggs. RANGE: Breeds in Alaska and across Canada to Newfoundland and the Maritime Provinces, south to mountains in Montana and Great Lakes. Winters in much of U.S., wherever water is open; also in Eurasia. HABITAT: Breeds on wooded lakes and ponds; winters mainly on coastal bays and estuaries. Dimensions: 24 1/4 in. x 11 in. x 13 in. Hole Size: 3 1/2 in. x 4 1/2 in. Construction: The duck house is made from Eastern White pine and the entrance hole is an oval hole that is 3 in. x 4 in. Please NOTE: Specifying Express Shipping for this duck house is very expensive due to its weight and size.